Flaming blasters, exotic aliens, strange worlds, speeding ships, political intrigue, corporate wars, mad scientists, noble (and not so noble) engineers, high tech societies, intelligent robots, cybernetic organisms...all this and more belongs to the universe of Journeyman. Be a part of the action and experience the greatest adventure of all time. Before there was Stellar Wind, there was Journeyman. In it you'll find some of the same alien races (but in different roles) and some of the same rules and concepts, but with a more free-wheeling and less "hard" sf feel. If you're interested in a complete system that doesn't kill you with realism, that lets you get a little more daring with your technology (I don't care if the engines are close to collapsing to a singularity, keep those grav drives on overload! ), and fulfills the promise of the original Traveler, then take a look at Journeyman, a game rich in the science fiction tradition of the early days of pen and paper RPG. Good luck, good adventuring, and may your blaster never jam! 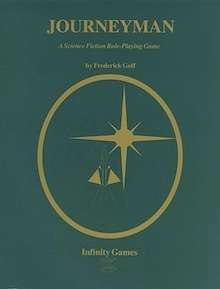 *Unfortunately, the original electronic files for the gamebook have not survived the passing years, and all we can offer is a scanned version of a printed book. We've tried to make the scan quality as good as possible, and have added bookmarks to aid in navigation. A very limited number of original print copies are still available. If interested, email us.